If you would like to speak with a City representative, please call the Public Information Office at 503-635-0257. To report unusual wildlife behavior in Lake Oswego, please complete the online reporting form. Lake Oswego Police Department at 911. All of us, at one time or another, are probably going to experience the excitement of seeing a coyote or other urban wildlife. And although such experiences are wonderful and quite memorable, sometimes they can also cause concern. Coyotes are an extremely adaptable wildlife species that survive well in urban environments, including Lake Oswego. Why do we have coyotes in Lake Oswego? Some people believe coyotes live in Lake Oswego because their habitat has been reduced as a result of development, but actually we have created habitat for coyotes by expanding our urban areas. Large rodent populations, accessible garbage and plenty of green spaces are all reasons why coyotes call urban areas home. In rural wild environments, up to 70 percent of a coyote’s diet consists of small mammals (mice, rats, rabbits, moles, squirrels, etc.). The remaining 30 percent is a combination of fruits, vegetables, insects, fish, birds, eggs and other available items. In urban areas coyotes will also eat garbage, yard fruit, and pet food. They will continue to eat small mammals including small domestic pets. Coyotes can be active anytime of day or night. An increase in sightings may occur in the spring and summer months. Coyote young are born in the spring and food requirements of nursing females and growing young remain high through late summer. Conflicts between people and coyotes in Lake Oswego are very rare. There are hundreds of animal bites reported in Oregon each year, however, none of these bites have been attributed to a coyote (as reported by the Lake Oswego Police Department and Audubon Society). Coyotes in the urban environment have an adequate food supply and are capable of surviving in this environment without our help. Feeding coyotes (either directly or indirectly by keeping pet food or garbage accessible) can put yourself, your neighbors and the coyote at risk. A coyote that becomes dependent on humans for food may become too bold around humans and have to be destroyed. When are coyotes a risk to people? Although naturally curious, coyotes are usually timid animals and normally run away if challenged. Coyotes can be a risk to people if they have become comfortable around humans, usually as the result of feeding. It is not normal for coyotes to attack or pursue humans, especially adults; it is a learned response to human behavior. You can discourage coyotes from feeling comfortable around you by responding to their presence and eliminating coyote attractants (food sources) from your yard and neighborhood. Work with your neighbors to make sure they have removed attractants as well. Read more about how to keep coyotes out of your yard and keep your pets safe. If the coyote continues to approach, DO NOT RUN or turn your back on the coyote. Read more about appropriate responses for various coyote behaviors. If you own a cat: The only way to guarantee your cat’s safety is to keep it indoors. Outdoor cats face potential death from cars, diseases, parasites, raccoons and dogs, in addition to coyotes. Dogs are required to be on a leash in all public areas unless in designated off-leash parks. Coyotes play an important role in maintaining healthy ecosystems. The majority of coyotes feed primarily on mice, rats and other rodent pests in Lake Oswego's parks, backyards, cemeteries, and golf courses and open space. They are just one part of our diverse ecosystem. Eradication programs in North American cities have proven to be expensive failures. While eradication may remove (kill) an individual coyote, if the coyote habitat - habitats that satisfy their need for food and water, a place to rest and sleep, cover for rearing young, and protection from predators - remains, it will be filled by other coyotes. If a wild or domestic animal behaves aggressively toward humans it needs to be reported immediately reported to the Lake Oswego Police Department at 911. The City of Lake Oswego reports patterns of behavior that raise concern and reports of aggressive behavior to the Oregon Department of Fish and Wildlife. 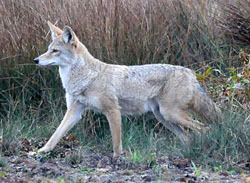 The City consults with ODFW if action is needed to locate and eliminate a coyote.